When buying or selling a dental practice, one of the key elements of the deal is the ability to accurately answer the question – how much is your dental practice worth? Is this a good practice to buy? If yes, what price is fair to pay? If I pay that much, how much should I expect to make? As a seller, the selling price of the practice can feel like the culmination of a career’s worth of effort growing and developing a dental business. When I help buyers consider the price of a practice, I remind them of a key fact: you don’t want to overpay for a practice, BUT wealth in dentistry does not come from buying and selling dental practices. The true value of a dental practice is the ownership of a stream of income – hopefully for a period of decades. Still, as the buyer, you want to feel like you’re not getting ripped off. We’ve analyzed the data of the fifty+ transitions we’ve been involved with at Practice Financial Group recently and compared it to public data provided by Jonathan Martin, CPA in the McGill Hill Group Newsletter. Full disclosure: Jonathan and the folks at McGill hill did the heavy lifting here, and we supplemented with our own data. Their original article is definitely worth a look. The total number of transitions analyzed is 816 over the last 15-year period beginning January 1, 2003. When trying to negotiate buying a dental practice, it’s important to find ways to negotiate beyond just the price. A good negotiation is one where you can avoid simply haggling over one number. In last week’s post, we discussed how a buyer can get real dollars in their pocket by negotiating the purchase of the accounts receivable. Today we’ll discuss another great way to find real value when you negotiate buying a dental practice – the asset allocation. 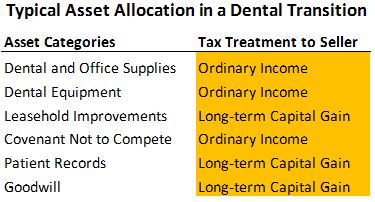 What is the Asset Allocation on a Dental Practice Transition? Not true, says the IRS. When you buy a pair of shoes in the store you really are only buying one “thing.” It’s a one-for-one exchange. Money for a sweet pair of kicks. When you buy a business, however, you’re paying for multiple different types of assets. You’re buying supplies, equipment, goodwill, and other types of assets. There are different accounting and tax rules around those different types of assets. If you’re savvy, you’ll look at the asset allocation as an opportunity to negotiate a win/win for you and the seller. The primary reason the asset allocation matters is the IRS allows different depreciation time periods for different asset types. Depreciation is easy to understand with a quick example. Pretend you stumbled upon a genie right after graduating dental school. One of the wishes the genie offered you is for your first job as a dentist to pay you for the next 5 years of work all in advance. There you are, the morning of your first day as a real dentist, gigantic check in hand and feeling good. You’ve got a pile of money and haven’t had to work for it yet. Honest person you are, you are still going to show up to work and work just as hard as if the owner was just paying you as you go. But what about the owner? Does she get to say she had a gigantic expense in year 1 and avoid taxes that year? The IRS would apply depreciation rules to my completely ridiculous example and only allow the owner to count 1/5 of that gigantic check of yours for each of the next five years. After all, the gigantic paid-in-advance check is for your next 5 year’s work. The same principle applies to any asset you purchase as a business owner that has a value of more than $600 and a useful life of more than a year. For example, when you buy a computer, you’re probably going to use it for more than 1 year, and as such there are rules about how much of the computer’s price you get to expense on each year’s tax return. Depreciation is the rule that allocates value to a tangible asset over its useful life. It’s an attempt by the IRS to match the expense of an item to the revenue that the asset helps you earn. The IRS has two ways to tax sales of assets where the seller makes money – ordinary income and long-term capital gains. Let’s look at ordinary income first. This is the type of tax most people are familiar with. 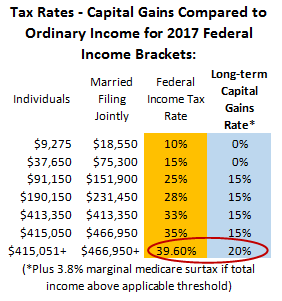 The ordinary income tax rates start at 10% and go up to a whopping 39.6%! If you are a seller, the obvious takeaway from this difference is that you want as much of your income to fall in an asset category where the IRS will tax it as capital gains, and not ordinary income. Doing this could save you as much as 20% on whatever money you can move from an ordinary income category to a capital gains category. Huge savings! An important point to consider is as long as the buyer and seller are both consistent in how they treat the values in the different categories (they are both required to report these numbers to the IRS independently), the actual amounts allocated to the different assets is negotiable. What does the law say? 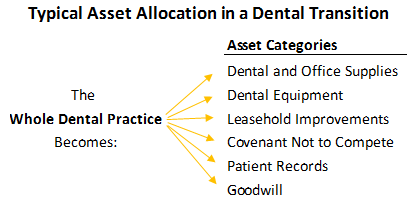 According to the IRS, the technical way to allocate the purchase price among the different assets is to allocate the Fair Market Value to the identifiable assets (patient records, equipment, supplies, etc. ), then the remainder, if any, is allocated to Goodwill. Many buyers assume the values assigned to the different categories are predetermined and set in stone. However, the definition of “Fair Market Value” is the price an independent buyer and seller can agree upon. So basically as long as you and the seller agree on the price allocated to the assets, that price is correct. So what’s the point? As the buyer, you’re looking for opportunities to negotiate with the seller on more than just the asking price. Ideally, there are lots of different areas where your interests overlap or, at least, aren’t directly opposed to one another. We now have three categories with significant dollars behind them where the buyer and seller can move levers to find the option that works best for everyone and leaves everyone happy – price, accounts receivable, and asset allocation. Purchase price, accounts receivable and asset allocation are not the only items you can negotiate when buying a dental practice. They’re the main items with real dollars behind them. But what if you need a little more ammunition as the buyer? What if you need a little extra push to get a seller on board with a plan that works well for you? If there’s one eternal truth I’ve seen when helping buyers purchase a dental practice, it’s this: The more knowledge and more options there are, the higher the chance of pulling together a deal. Ultimately, most buyers and sellers want the same thing. They want to successfully transition the business into new, responsible hands that will take great care of the staff and patients. They want to be rewarded for all the hard work they’ve done to that point – the seller with a gigantic check and the buyer with a steady income stream from a healthy business. You’re more likely to get a win/win with a seller if you know what you can negotiate. Price is always negotiable. Purchasing the accounts receivable is a good negotiating point too. A great third option with real dollars behind it is the asset allocation. Know a few of the basics and work with your dental accounting firm to advise you on how you can profitably negotiate with the seller and create a situation where everyone wins. Know someone about to buy a practice? Share this article with them! Or, have them reach out directly to me via email: brian@practicefinancialgroup.com to help them through the process. Read more below about dental transitions because you want to negotiate a great deal! On Friday I experienced a parenting moment that reminded me of trying to negotiate buying a dental practice and how quickly things can go badly. I had promised the kids each a small bag of M&Ms after work. I followed through and delivered. I tallied the dad points in my head. Then, of course, I watched as the 2 year-old ripped open the bag and one single, solitary green M&M escaped and fell, rolling onto the floor. Her 3 year-old sister was fast. She jumped down, snagged it, and popped it in her mouth in full view of the 2 year-old who still had an entire bag of chocolate happiness, minus one escapee. The 2 year-old dissolved in tears and threw a fit. One escapee M&M made her so angry that the rest of the bag in front of her didn’t even register. It’s the kind of thinking that can ruin a perfectly good deal. 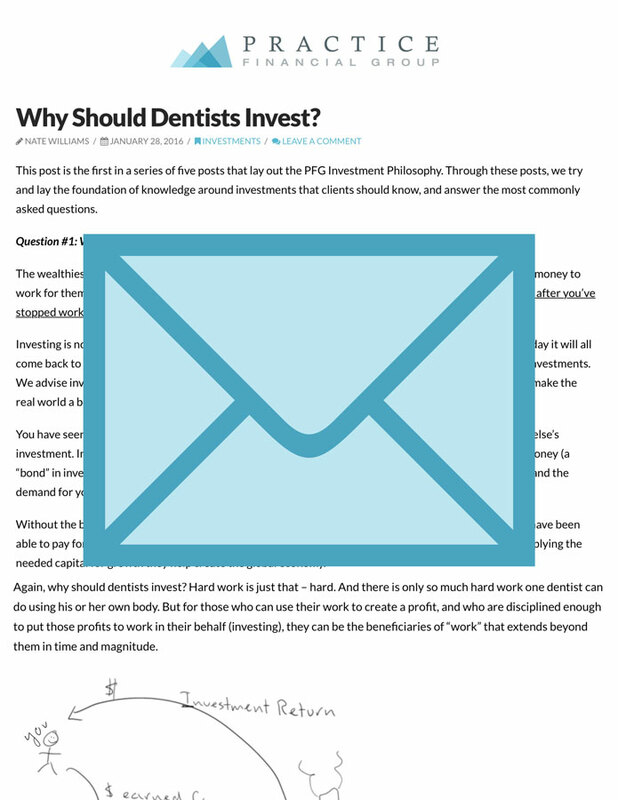 When buying a dental practice, how do you know what to do after the letter of intent? 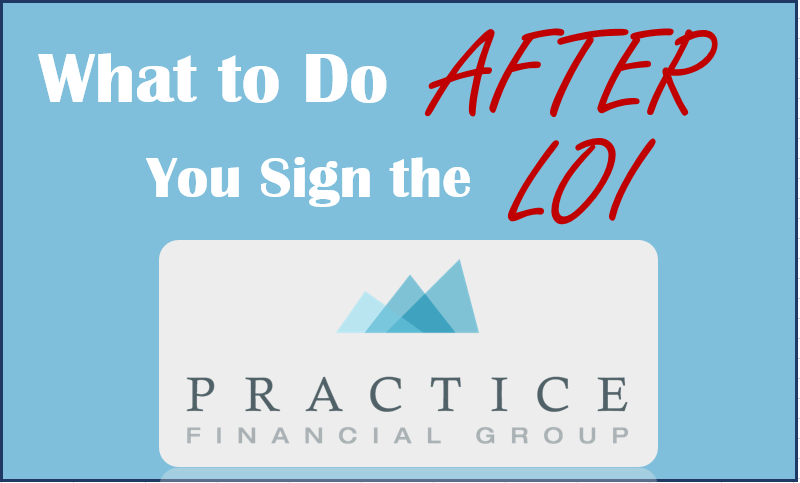 Almost always, there is a period of time between when you’ve negotiated the letter of intent and when you walk through the front doors of your new practice, keys in hand, as the brand new owner. Picture the moment: You park the car and start walking toward those front doors you own for the first time! The opening few bars of “Sweet Emotion” by Aerosmith are running through your head. You own your own practice now, you stunning piece of humanity! If there was a confident emoji, it would look like you. With a little knowledge of what to do, you can feel confident. You can feel ready. You can walk through those doors, humming Aerosmith, knowing you’ve taken care of the essentials and you’re ready to wow your patients and continue an amazing career! The steps below outline what to do after the letter of intent. Getting the Letter of Intent Right is Crucial – But How Do You Know? Make sure you and the seller are clear on how long you and your dental accountant (you have one, right?) will need to review the practice and financial information. I typically recommend at least 30 days. Need help evaluating your LOI? Reach out to me at brian@practicefinancialgroup.com for a free consultation around your situation because this is an important decision! A few weeks ago I had the chance to scratch an item off my bucket list when I flew to New York and saw the US Open tennis tournament live. As a casual fan and player, I loved the opportunity to sit as close to 10 feet away from Nadal, Murray, Djokovic and Williams – the best in the world. As I watched them play, I could predict who would win almost every time by looking at only one statistic: unforced errors. An unforced error is a lost point entirely the result of a player’s own blunder, and not because of how well the other player has played. As dentists struggle to repay record levels of student-loan debt, many are making unforced errors that threaten their long-term financial security and delay retirement. Cost. I ran a quote on myself for a $2.5-million-dollar term life policy. (For the record, I’m 35, a non-smoker, and frequently offered underwear modeling contracts that I graciously decline. Two out of three of those facts are true.) The cost was $1,760/year. I then ran a quote for a whole life policy worth $250,000 (10% of the amount my wife would get if I die, compared to the term policy.) The cost was $3,440/year. This is double the cost for 10% of the benefit with whole life. Term insurance is always much cheaper. The brutal fact is in order to be adequately covered, you’ll probably need a large amount of coverage. If you feel better with a whole life policy, the cost to get to that big number becomes so prohibitive, that most choose inadequate coverage and the family suffers as a result. Timing. Today, right now, you’re as young and likely as healthy as you’re ever going to be. That means, that your insurance policy is as cheap as it’s ever going to be too. Truthfully that applies equally to both types of insurance. However, when you’re older, term life insurance may not be an option. Or, it may be so expensive that you may not want to purchase it. I spoke with a dentist recently who, in his 50’s, had not been as successful in his career as he thought he’d be in his early 30’s. He had a whole life policy, but was concerned about large family obligations and debt load. He had recently lost a parent unexpectedly and, being reminded of his mortality, was surprised to learn insurance companies were quoting annual premiums 10- to 15-times higher than he thought he’d need to pay. He is still uninsured. Term is straightforward and easy to understand. One thing that drives financial advisors like me up the wall is when we see the assumptions in the presentation given to dentists about choosing a whole life policy. So often the assumptions are not realistic. As a new dentist, you don’t know any better. Why would you? Just like I don’t know that one dentist’s choice to choose a cheap composite on my filling was a poor choice, often times I see people making poor decisions about insurance based on assumptions that are very unrealistic. Term insurance is simple. Pay a small premium, and if you die, your heirs get a big check. That’s it. Simpler is better here. Trust me. If I could get back the hundreds of hours I’ve wasted trying to understand the inner workings of whole life, and reinvest it with my kids, I’d do it in a heartbeat. Insurance is not an investment. Insurance is a transference of risk. You transfer the risk over many people similar to you, which reduces everyone’s risk. When you try to overlay investments on top of that, it gets exponentially more expensive. Keep your insurance in its own lane, and keep investments in their own lane. Besides, as a new dentist, you’re probably more focused on increasing your earnings and paying down debt. Investing serious amounts of money probably won’t come for at least a few years into your career. You’re not making your insurance agent rich – Commissions on insurance policies can run anywhere from 55% to 100% of the first year’s premium. You saw how differently term and whole life policies get priced with my own example. Thus, human nature being what it is, your insurance agent has a strong incentive to sell you the more expensive policy. Not every insurance agent will push you towards an inferior option. In fact, we work closely with several insurance agents we know and trust. However, we’ve seen the results of enough poorly understood and poorly placed whole life policies, that we know bad actors are out there. When looking for a practice to buy, it’s obvious to an outsider when things aren’t a good fit. I had with a dentist with a few years of an associateship under her belt about her search for a practice in the suburbs of Seattle. Married with a few kids, she and her husband spoke at length with me about the importance of good schools and a short commute. They wanted to raise her kids in an environment similar to their suburban upbringing. But, like a lot of doctors looking for a practice to buy, she was having trouble finding one that fit her criteria. She called me about a practice in Downtown Seattle, outside where she was normally looking. We looked at the numbers of the practice, and the quantitative side of the analysis could work. However, I was concerned about her desire for a short commute and the practice location. Don’t get married or buy a practice, just because you’re mentally ready to move on to your next career step. How do you do that? The numbers have to work, obviously. But you’ve got to get the qualitative side of a dental practice right too. What do you notice about the non-front-and-center equipment: delivery units, compressor, vacuum, nitrous, etc? “….um….I’m not sure…” was the response. We talked for a few minutes about how much she wanted to make and when she wanted to be debt free. From there I took a quick glance through the financial documents she had and, focused on six or seven numbers. Within a few minutes I had a pretty good idea of whether or not this student was considering a financially “good” practice. Leadership is a difficult concept to teach. It’s easier to show an example of a good leader than to describe what makes a good leader.